Before we begin, there are some things that I hope you have a basic foundation in. 4) Basic common sense, deductive, and comprehension skllls. This is very important to ensure that you know what I am talking about. 5) The .ANI that you want to lengthen. Without it, what is the point of this tutorial? How do Script Indexes Work? When we talk about lengthening Script.ANI, we are talking about lengthening the script indexes. So what are script indexes? They are the each specific part of the script that starts with LONG gibberish and ends before another LONG gibberish/ 0D0A Hex. Sounds gibberish enough? .........×#<....'‰º”¼.g‚Ì‚Ý..IF(@int ,==, 0);....BURNER(0);..BURNER(1);..BURNER(2);..BURNER(3);..BURNER(4);..BURNER(5);..Move=(0,STOP,0);..Force=(0,STOP,0);..GvEnable=0;..ShotTurnAng = 20;..LockBodyDownTarget(60,60);..Voice(S_Attack);....ChangeWeapon(GUN);......ENDIF;......ÍÌÌ=¹...'‰º”¼.g‚Ì‚Ý..IF(@int ,==, 0);....BURNER(0);..BURNER(1);..BURNER(2);..BURNER(3);..BURNER(4);..BURNER(5);..GvEnable=0;..ShotTurnAng = 3;..LockBodyDownTarget(60,60);......ENDIF;.......×£;¹...'‰º”¼.g‚Ì‚Ý..IF(@int ,==, 0);....BURNER(0);..BURNER(1);..BURNER(2);..BURNER(3);..BURNER(4);..BURNER(5);..GvEnable=0;..ShotTurnAng = 3;..LockBodyDownTarget(60,60);......ENDIF;..........¹...'‰º”¼.g‚Ì‚Ý..IF(@int ,==, 0);....BURNER(0);..BURNER(1);..BURNER(2);..BURNER(3);..BURNER(4);..BURNER(5);..GvEnable=0;..ShotTurnAng = 3;..LockBodyDownTarget(60,60);......ENDIF;......ÍÌL>p...'‰º”¼.g‚Ì‚Ý..IF(@int ,==, 0);....BURNER(0);..BURNER(1);..BURNER(2);..BURNER(3);..BURNER(4);..BURNER(5);..GvEnable=0;..ShotTurnAng = 3;..LockBodyDownTarget(60,60);....ATTACK(50, 50, 0.1, 0);..AttackFlag = 3;.... '1”ÔƒŒ.[ƒU.[.. 'WP Ene Len Speed*100 •.*100.. '’Ç‰Á’Ç”ö—Í(%) TexNo.. RunProc2(0,1, 0,100,30,100,20,0,0,0,0,0);....ENDIF;.. The Cyan parts are the start of each script index, while the Yellow parts represents the ends. If you realised, there are ENDIFs at the end of all of the script indexes. This is actually not compulsory to end the script index, but it is mandatory to end a conditional command which I would talk about soon. Here are more examples of script indexes. Do NOTE that you HAVE to understand where/how a script index starts and end first, how to identify a script index before moving on. This would serve as your basic foundation to advanced .ANI modding. Note: The long gibberish sentence somewhere in the middle in the picture below is actually the original author's own notes. They are not important in defining a script index. The "IF(@int ,==, 0);" and "ENDIF;.." statements that you see in each script index is actually part of a command. This is a conditional command to the game to ask it to play a certain action if a certain condition is fulfilled. The main point is, as such: A script index NEED NOT have a "IF(@int ,==, 0);" and "ENDIF;.." statement to work. Most values that starts with HEX 27 (') apostrophe and ends with HEX 0D 0A (paragraph) are just comments. You can delete them and replace with your own string, or notes. And those comments in the middle of if string represent what the RunProc2 value is. You can just open the file in Notepad++, set the encoding to Japanese, copy the line and translate via Google see what the author is talking about. In case anyone is curious, the ENDIF is simply End-If, to end off the If(.....); statement. So basically, what I am trying to show is how script indexes are independent ON THEIR OWN, not on any conditional commands. Before gameplay, the game would always physically check through a script.ani for any mistakes. While allowing the game to still continue. 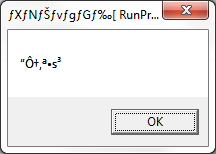 However when the attack used contains the error that the game warns, something will go wrong with the game. Either a forced shutdown of the game or a repeated showcase of the error occurs. The left one would be a general error, where something is horribly wrong with your script, whereas the right one is a precise error, where the program tells you where the error lies in. In this case, it would be action number 131 and script index number 3. During gameplay, when an attack is executed, the game machine instantly locates the part of the attack in the script that would be used. It then reads the FIRST script index completely before executing that part of the move. Here is a visual illustration. As you can see, even with an error, I am allowed to play the script. However, look at what happens next. Pardon me for the lack of quality of my videos. If you listened carefully, 5 shots were fired before the error popped up. A standard KD-05_3 Windom XP SP-3 subattack 3 has 6 shots. This means that an error occured on the script index containing the 6th shot / before the 6th shot, after the 5th shot (If the error occurs after the 5th RunProc2, then the entire attack would not continue at all). Look at the actual script below. The Orange parts are the commands responsible for the shots, while the Red part shows the error that I deliberately added. Numbers are added by the side for easier reference. .........×#<....'‰º”¼.g‚Ì‚Ý..IF(@int ,==, 0);....BURNER(0);..BURNER(1);..BURNER(2);..BURNER(3);..BURNER(4);..BURNER(5);..Move=(0,STOP,0);..Force=(0,STOP,0);..GvEnable=0;..ShotTurnAng = 20;..LockBodyDownTarget(60,60);..Voice(S_Attack);....ChangeWeapon(GUN);......ENDIF;......ÍÌÌ=¹...'‰º”¼.g‚Ì‚Ý..IF(@int ,==, 0);....BURNER(0);..BURNER(1);..BURNER(2);..BURNER(3);..BURNER(4);..BURNER(5);..GvEnable=0;..ShotTurnAng = 3;..LockBodyDownTarget(60,60);......ENDIF;.......×£;¹...'‰º”¼.g‚Ì‚Ý..IF(@int ,==, 0);....BURNER(0);..BURNER(1);..BURNER(2);..BURNER(3);..BURNER(4);..BURNER(5);..GvEnable=0;..ShotTurnAng = 3;..LockBodyDownTarget(60,60);......ENDIF;..........¹...'‰º”¼.g‚Ì‚Ý..IF(@int ,==, 0);....BURNER(0);..BURNER(1);..BURNER(2);..BURNER(3);..BURNER(4);..BURNER(5);..GvEnable=0;..ShotTurnAng = 3;..LockBodyDownTarget(60,60);......ENDIF;......ÍÌL>p...'‰º”¼.g‚Ì‚Ý..IF(@int ,==, 0);....BURNER(0);..BURNER(1);..BURNER(2);..BURNER(3);..BURNER(4);..BURNER(5);..GvEnable=0;..ShotTurnAng = 1;..LockBodyDownTarget(60,60);....ATTACK(50, 50, 0.1, 0);..AttackFlag = 3;.... '1”ÔƒŒ.[ƒU.[.. 'WP Ene Len Speed*100 •.*100.. '’Ç‰Á’Ç”ö—Í(%) TexNo.. 1RunProc2(0,1, 0,100,30,100,20,0,0,0,0,0);....ENDIF;......ÍÌL>¹...'‰º”¼.g‚Ì‚Ý..IF(@int ,==, 0);....BURNER(0);..BURNER(1);..BURNER(2);..BURNER(3);..BURNER(4);..BURNER(5);..GvEnable=0;..ShotTurnAng = 1;..LockBodyDownTarget(60,60);......ENDIF;......ÍÌL>r...'‰º”¼.g‚Ì‚Ý..IF(@int ,==, 0);....BURNER(0);..BURNER(1);..BURNER(2);..BURNER(3);..BURNER(4);..BURNER(5);..GvEnable=0;..ShotTurnAng = 1;..LockBodyDownTarget(60,60);....ATTACK(50, 50, 0.1, 0);..AttackFlag = 3;.... '1”ÔƒŒ.[ƒU.[.. 'WP Ene Len Speed*100 •.*100.. '’Ç‰Á’Ç”ö—Í(%) TexNo.. 2RunProc2(0,1, 0,100,30,100,20,0,0,0,0,0);......ENDIF;......ÍÌL>¹...'‰º”¼.g‚Ì‚Ý..IF(@int ,==, 0);....BURNER(0);..BURNER(1);..BURNER(2);..BURNER(3);..BURNER(4);..BURNER(5);..GvEnable=0;..ShotTurnAng = 1;..LockBodyDownTarget(60,60);......ENDIF;......ÍÌL>r...'‰º”¼.g‚Ì‚Ý..IF(@int ,==, 0);....BURNER(0);..BURNER(1);..BURNER(2);..BURNER(3);..BURNER(4);..BURNER(5);..GvEnable=0;..ShotTurnAng = 1;..LockBodyDownTarget(60,60);....ATTACK(50, 50, 0.1, 0);..AttackFlag = 3;.... '1”ÔƒŒ.[ƒU.[.. 'WP Ene Len Speed*100 •.*100.. '’Ç‰Á’Ç”ö—Í(%) TexNo.. 3RunProc2(0,1, 0,100,30,100,20,0,0,0,0,0);......ENDIF;......ÍÌL>¹...'‰º”¼.g‚Ì‚Ý..IF(@int ,==, 0);....BURNER(0);..BURNER(1);..BURNER(2);..BURNER(3);..BURNER(4);..BURNER(5);..GvEnable=0;..ShotTurnAng = 1;..LockBodyDownTarget(60,60);......ENDIF;......ÍÌL>r...'‰º”¼.g‚Ì‚Ý..IF(@int ,==, 0);....BURNER(0);..BURNER(1);..BURNER(2);..BURNER(3);..BURNER(4);..BURNER(5);..GvEnable=0;..ShotTurnAng = 1;..LockBodyDownTarget(60,60);....ATTACK(50, 50, 0.1, 0);..AttackFlag = 3;.... '1”ÔƒŒ.[ƒU.[.. 'WP Ene Len Speed*100 •.*100.. '’Ç‰Á’Ç”ö—Í(%) TexNo.. 4RunProc2(0,1, 0,100,30,100,20,0,0,0,0,0);......ENDIF;......ÍÌL>¹...'‰º”¼.g‚Ì‚Ý..IF(@int ,==, 0);....BURNER(0);..BURNER(1);..BURNER(2);..BURNER(3);..BURNER(4);..BURNER(5);..GvEnable=0;..ShotTurnAng = 1;..LockBodyDownTarget(60,60);......ENDIF;......ÍÌL>r...'‰º”¼.g‚Ì‚Ý..IF(@int ,==, 0);....BURNER(0);..BURNER(1);..BURNER(2);..BURNER(3);..BURNER(4);..BURNER(5);..GvEnable=0;..ShotTurnAng = 1;..LockBodyDownTarget(60,60);....ATTACK(50, 50, 0.1, 0);..AttackFlag = 3;.... '1”ÔƒŒ.[ƒU.[.. 'WP Ene Len Speed*100 •.*100.. '’Ç‰Á’Ç”ö—Í(%) TexNo.. 5RunProc2(0,1, 0,100,30,100,20,0,0,0,0,0);......ENDIF;......ÍÌL>¹...'‰º”¼.g‚Ì‚Ý..IF(@int ,==, 0);....BURNER(0);..BURNER(1);..BURNER(2);..BURNER(3);..BURNER(4);..BURNER(5);..GvEnable=0;..ShotTurnAng = 1;..LockBodyDownTarget(60,60);......ENDIF;......ÍÌL>s...'‰º”¼.g‚Ì‚Ý..IF(@int ,==, 0);....BURNER(0);..BURNER(1);..BURNER(2);..BURNER(3);..BURNER(4);..BURNER(5);..GvEnable=0;..ShotTurnAng = 1;..LockBodyDownTarget(60,60);....ATTACK(50,50,0.4,0,30);..AttackFlag = 10;.... '1”ÔƒŒ.[ƒU.[.. 'WP Ene Len Speed*100 •.*100.. '’Ç‰Á’Ç”ö—Í(%) TexNo.. 6RunProc2(0,1, 0,100,30,100,20,0,0,0,0,0);......ENDIF;.......×#=Ð...'‰º”¼.g‚Ì‚Ý..IF(@int ,==, 0);....BURNER(0);..BURNER(1);..BURNER(2);..BURNER(3);..BURNER(4);..BURNER(5);..GvEnable=0;..ShotTurnAng = 1;..LockBodyDownTarget(999,999);..AttackDelay(4,600);......ENDIF;..........P...'‰º”¼.g‚Ì‚Ý..IF(@int ,==, 0);....LockBodyDownTarget(-1,-1);....ENDIF;.. 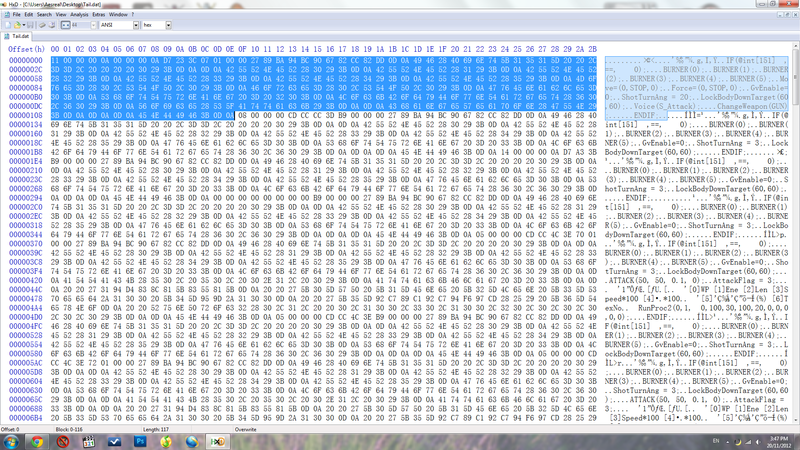 In summary, the main point of this is just to show how script indexes are processed by the game. First they check the entire script for errors, then ingame, when an attack is executed, each portion of the script index is scrutinised one after the other. If they are all checked at the same time, the moment the Subattack 3 key is pressed, I would have gotten an error, which I did not. 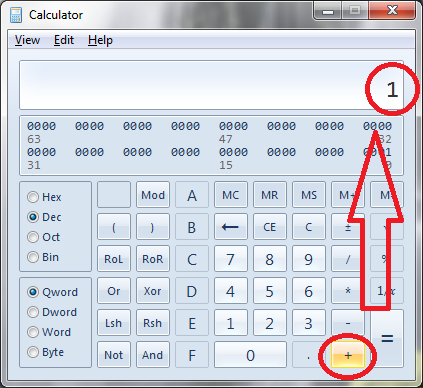 Therefore, it allows you to zoom in to your mistakes much more easily as well. For those lost at what action numbers exactly are, here is a list for your convenience. Oujar from 3DGundam has posted a list of actions. Credits in the table below goes to him. Translation and the sword basic movements were added by me. Notice anything? They are extremely similar, arranged according to your tail.dat files and attacks. They can also be used as reference to the SwordCancel command. This is a small but important part about script indexes. Take a look at the script of KD-05_3's subattack 3 below. 0.........×#<....'‰º”¼.g‚Ì‚Ý..IF(@int ,==, 0);....BURNER(0);..BURNER(1);..BURNER(2);..BURNER(3);..BURNER(4);..BURNER(5);..Move=(0,STOP,0);..Force=(0,STOP,0);..GvEnable=0;..ShotTurnAng = 20;..LockBodyDownTarget(60,60);..Voice(S_Attack);....ChangeWeapon(GUN);......ENDIF;..1....ÍÌÌ=¹...'‰º”¼.g‚Ì‚Ý..IF(@int ,==, 0);....BURNER(0);..BURNER(1);..BURNER(2);..BURNER(3);..BURNER(4);..BURNER(5);..GvEnable=0;..ShotTurnAng = 3;..LockBodyDownTarget(60,60);......ENDIF;..2.....×£;¹...'‰º”¼.g‚Ì‚Ý..IF(@int ,==, 0);....BURNER(0);..BURNER(1);..BURNER(2);..BURNER(3);..BURNER(4);..
BURNER(5);..GvEnable=0;..ShotTurnAng = 3;..LockBodyDownTarget(60,60);......ENDIF;..3........¹...'‰º”¼.g‚Ì‚Ý..IF(@int ,==, 0);....BURNER(0);..BURNER(1);..BURNER(2);..BURNER(3);..BURNER(4);..BURNER(5);..GvEnable=0;..ShotTurnAng = 3;..LockBodyDownTarget(60,60);......ENDIF;..4....ÍÌL>p...'‰º”¼.g‚Ì‚Ý..IF(@int ,==, 0);....BURNER(0);..BURNER(1);..BURNER(2);..BURNER(3);..BURNER(4);..BURNER(5);..GvEnable=0;..ShotTurnAng = 1;..LockBodyDownTarget(60,60);....ATTACK(50, 50, 0.1, 0);..AttackFlag = 3;.... '1”ÔƒŒ.[ƒU.[.. 'WP Ene Len Speed*100 •.*100.. '’Ç‰Á’Ç”ö—Í(%) TexNo.. RunProc2(0,1, 0,100,30,100,20,0,0,0,0,0);....ENDIF;..5....ÍÌL>¹...'‰º”¼.g‚Ì‚Ý..IF(@int ,==, 0);....BURNER(0);..BURNER(1);..BURNER(2);..BURNER(3);..BURNER(4);..BURNER(5);..GvEnable=0;..ShotTurnAng = 1;..LockBodyDownTarget(60,60);......ENDIF;..6....ÍÌL>r...'‰º”¼.g‚Ì‚Ý..IF(@int ,==, 0);....BURNER(0);..BURNER(1);..BURNER(2);..BURNER(3);..BURNER(4);..BURNER(5);..GvEnable=0;..ShotTurnAng = 1;..LockBodyDownTarget(60,60);....ATTACK(50, 50, 0.1, 0);..AttackFlag = 3;.... '1”ÔƒŒ.[ƒU.[.. 'WP Ene Len Speed*100 •.*100.. '’Ç‰Á’Ç”ö—Í(%) TexNo.. RunProc2(0,1, 0,100,30,100,20,0,0,0,0,0);......ENDIF;..7....ÍÌL>¹...'‰º”¼.g‚Ì‚Ý..IF(@int ,==, 0);....BURNER(0);..BURNER(1);..BURNER(2);..BURNER(3);..BURNER(4);..BURNER(5);..GvEnable=0;..ShotTurnAng = 1;..LockBodyDownTarget(60,60);......ENDIF;..8....ÍÌL>r...'‰º”¼.g‚Ì‚Ý..IF(@int ,==, 0);....BURNER(0);..BURNER(1);..BURNER(2);..BURNER(3);..BURNER(4);..BURNER(5);..GvEnable=0;..ShotTurnAng = 1;..LockBodyDownTarget(60,60);....ATTACK(50, 50, 0.1, 0);..AttackFlag = 3;.... '1”ÔƒŒ.[ƒU.[.. 'WP Ene Len Speed*100 •.*100.. '’Ç‰Á’Ç”ö—Í(%) TexNo.. RunProc2(0,1, 0,100,30,100,20,0,0,0,0,0);......ENDIF;..9....ÍÌL>¹...'‰º”¼.g‚Ì‚Ý..IF(@int ,==, 0);....BURNER(0);..BURNER(1);..BURNER(2);..BURNER(3);..BURNER(4);..BURNER(5);..GvEnable=0;..ShotTurnAng = 1;..LockBodyDownTarget(60,60);......ENDIF;..10....ÍÌL>r...'‰º”¼.g‚Ì‚Ý..IF(@int ,==, 0);....BURNER(0);..BURNER(1);..BURNER(2);..BURNER(3);..BURNER(4);..BURNER(5);..GvEnable=0;..ShotTurnAng = 1;..LockBodyDownTarget(60,60);....ATTACK(50, 50, 0.1, 0);..AttackFlag = 3;.... '1”ÔƒŒ.[ƒU.[.. 'WP Ene Len Speed*100 •.*100.. '’Ç‰Á’Ç”ö—Í(%) TexNo.. RunProc2(0,1, 0,100,30,100,20,0,0,0,0,0);......ENDIF;..11....ÍÌL>¹...'‰º”¼.g‚Ì‚Ý..IF(@int ,==, 0);....BURNER(0);..BURNER(1);..BURNER(2);..BURNER(3);..BURNER(4);..BURNER(5);..GvEnable=0;..ShotTurnAng = 1;..LockBodyDownTarget(60,60);......ENDIF;..12....ÍÌL>r...'‰º”¼.g‚Ì‚Ý..IF(@int ,==, 0);....BURNER(0);..BURNER(1);..BURNER(2);..BURNER(3);..BURNER(4);..BURNER(5);..GvEnable=0;..ShotTurnAng = 1;..LockBodyDownTarget(60,60);....ATTACK(50, 50, 0.1, 0);..AttackFlag = 3;.... '1”ÔƒŒ.[ƒU.[.. 'WP Ene Len Speed*100 •.*100.. '’Ç‰Á’Ç”ö—Í(%) TexNo.. RunProc2(0,1, 0,100,30,100,20,0,0,0,0,0);......ENDIF;..13....ÍÌL>¹...'‰º”¼.g‚Ì‚Ý..IF(@int ,==, 0);....BURNER(0);..BURNER(1);..BURNER(2);..BURNER(3);..BURNER(4);..BURNER(5);..GvEnable=0;..ShotTurnAng = 1;..LockBodyDownTarget(60,60);......ENDIF;..14....ÍÌL>s...'‰º”¼.g‚Ì‚Ý..IF(@int ,==, 0);....BURNER(0);..BURNER(1);..BURNER(2);..BURNER(3);..BURNER(4);..BURNER(5);..GvEnable=0;..ShotTurnAng = 1;..LockBodyDownTarget(60,60);....ATTACK(50, 50, 0.4, 0);..AttackFlag = 10;.... '1”ÔƒŒ.[ƒU.[.. 'WP Ene Len Speed*100 •.*100.. '’Ç‰Á’Ç”ö—Í(%) TexNo.. RunProc2(0,1, 0,100,30,100,20,0,0,0,0,0);......ENDIF;..15.....×#=Ð...'‰º”¼.g‚Ì‚Ý..IF(@int ,==, 0);....BURNER(0);..BURNER(1);..BURNER(2);..BURNER(3);..BURNER(4);..BURNER(5);..GvEnable=0;..ShotTurnAng = 1;..LockBodyDownTarget(999,999);..AttackDelay(4,600);......ENDIF;..16........P...'‰º”¼.g‚Ì‚Ý..IF(@int ,==, 0);....LockBodyDownTarget(-1,-1);....ENDIF;..
Each change in colour represents a change in Script Index. For the game, ALL SCRIPTS starts from script index 0. Followed by 1,2,3, and so on. 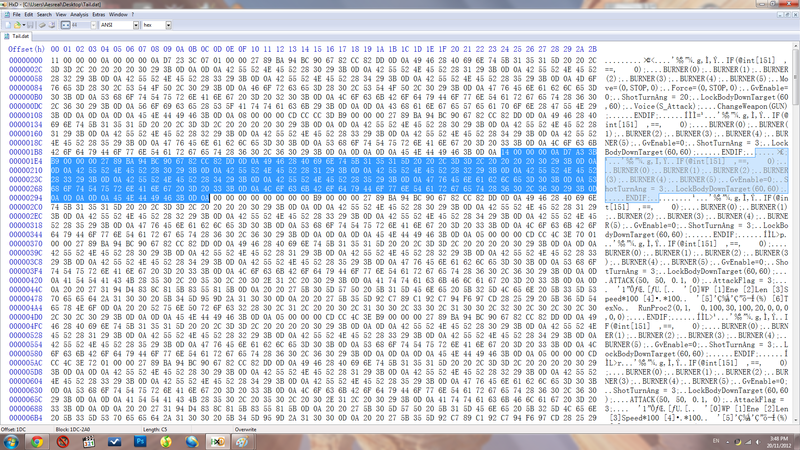 The script above is actually your so-called Tail.dat, but I copied it directly from its script.ani with Hex Editor. Each Tail.dat consists of (n+1) script indexes, where n is the last script index in a tail.dat file. In this case, 17 script indexes are present. However, when you use the GoScriptIndex(...); Command to direct the game to read off, say the 2nd script index, you need to input GoScriptIndex(1);. Say you want the game to direct the script back to the first shot, after executing the sixth shot (In KD-05_3 context), then input GoScriptIndex(4);, which is the 5th script index, where the first shot was first first shot. Hope you don't get confused with this one. That aside, if you were to use the examples I gave to script an attack, then good luck to you. The example I gave would cause an infinite loop where the mech would continue to fire beams after beams after beams, even firing nothing when the weapon bar is empty. With enough basics, let's get down to business. The MAJOR MAJOR problem that I'm sure almost all .ANI modders would agree with would be the problem of insufficient space. But thanks to ritcher (Whose account apparently seems to be deleted), the problem is solved! Do you remember why I emphasised on learning the ability to recognise a script index at the start of the tutorial? Well here is the reason. ....ÍÌL>p...'‰º”¼.g‚Ì‚Ý..IF(@int ,==, 0);....BURNER(0);..BURNER(1);..BURNER(2);..BURNER(3);..BURNER(4);..BURNER(5);..GvEnable=0;..ShotTurnAng = 1;..LockBodyDownTarget(60,60);....ATTACK(50, 50, 0.1, 0);..AttackFlag = 3;.... '1”ÔƒŒ.[ƒU.[.. 'WP Ene Len Speed*100 •.*100.. '’Ç‰Á’Ç”ö—Í(%) TexNo.. RunProc2(0,1, 0,100,30,100,20,0,0,0,0,0);....ENDIF;......ÍÌL>¹...'‰º”¼.g‚Ì‚Ý..IF(@int ,==, 0);....BURNER(0);..BURNER(1);..BURNER(2);..BURNER(3);..BURNER(4);..BURNER(5);..GvEnable=0;..ShotTurnAng = 1;..LockBodyDownTarget(60,60);......ENDIF;......ÍÌL>r...'‰º”¼.g‚Ì‚Ý..IF(@int ,==, 0);....BURNER(0);..BURNER(1);..BURNER(2);..BURNER(3);..BURNER(4);..BURNER(5);..GvEnable=0;..ShotTurnAng = 1;..LockBodyDownTarget(60,60);....ATTACK(50, 50, 0.1, 0);..AttackFlag = 3;.... '1”ÔƒŒ.[ƒU.[.. 'WP Ene Len Speed*100 •.*100.. '’Ç‰Á’Ç”ö—Í(%) TexNo.. RunProc2(0,1, 0,100,30,100,20,0,0,0,0,0);......ENDIF;......ÍÌL>¹...'‰º”¼.g‚Ì‚Ý..IF(@int ,==, 0);....BURNER(0);..BURNER(1);..BURNER(2);..BURNER(3);..BURNER(4);..BURNER(5);..GvEnable=0;..ShotTurnAng = 1;..LockBodyDownTarget(60,60);......ENDIF;......ÍÌL>r...'‰º”¼.g‚Ì‚Ý..IF(@int ,==, 0);....BURNER(0);..BURNER(1);..BURNER(2);..BURNER(3);..BURNER(4);..BURNER(5);..GvEnable=0;..ShotTurnAng = 1;..LockBodyDownTarget(60,60);....ATTACK(50, 50, 0.1, 0);..AttackFlag = 3;.... '1”ÔƒŒ.[ƒU.[.. 'WP Ene Len Speed*100 •.*100.. '’Ç‰Á’Ç”ö—Í(%) TexNo.. RunProc2(0,1, 0,100,30,100,20,0,0,0,0,0);......ENDIF;......ÍÌL>¹...'‰º”¼.g‚Ì‚Ý..IF(@int ,==, 0);....BURNER(0);..BURNER(1);..BURNER(2);..BURNER(3);..BURNER(4);..BURNER(5);..GvEnable=0;..ShotTurnAng = 1;..LockBodyDownTarget(60,60);......ENDIF;......ÍÌL>r...'‰º”¼.g‚Ì‚Ý..IF(@int ,==, 0);....BURNER(0);..BURNER(1);..BURNER(2);..BURNER(3);..BURNER(4);..BURNER(5);..GvEnable=0;..ShotTurnAng = 1;..LockBodyDownTarget(60,60);....ATTACK(50, 50, 0.1, 0);..AttackFlag = 3;.... '1”ÔƒŒ.[ƒU.[.. 'WP Ene Len Speed*100 •.*100.. '’Ç‰Á’Ç”ö—Í(%) TexNo.. RunProc2(0,1, 0,100,30,100,20,0,0,0,0,0);......ENDIF;..
Oh god.. Do you feel like dying looking at it? Jokes aside, you need to identify the starting parts the script index with its corresponding HEX values. 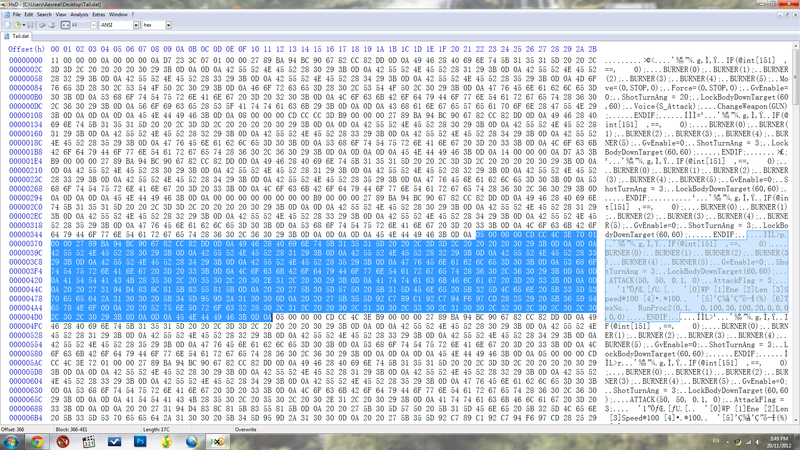 Your Hex Editor should be able to do that for you. For tutorial sake, I would highlight the exact values with the exact HEX values. Due to a lack of visible colours, I would be reusing them in the order, Orange, Cyan, Violet. I'm taking the first script index to teach you guys. ....ÍÌL>p...'‰º”¼.g‚Ì‚Ý..IF(@int ,==, 0);....BURNER(0);..BURNER(1);..BURNER(2);..BURNER(3);..BURNER(4);..BURNER(5);..GvEnable=0;..ShotTurnAng = 1;..LockBodyDownTarget(60,60);....ATTACK(50, 50, 0.1, 0);..AttackFlag = 3;.... '1”ÔƒŒ.[ƒU.[.. 'WP Ene Len Speed*100 •.*100.. '’Ç‰Á’Ç”ö—Í(%) TexNo.. RunProc2(0,1, 0,100,30,100,20,0,0,0,0,0);....ENDIF;..
05 00 00 00 CD CC 4C 3E 70 01 00 00 27 89 BA 94 BC 90 67 82 CC 82 DD 0D 0A ....ÍÌL>p...'‰º”¼.g‚Ì‚Ý..
First, IDENTIFY the part of the beginning of the script index that shows 00 00 00, followed by 6 HEX VALUES, and ends with 00 00. In this case, the highlighted portion in Cyan would be what we are interested in. 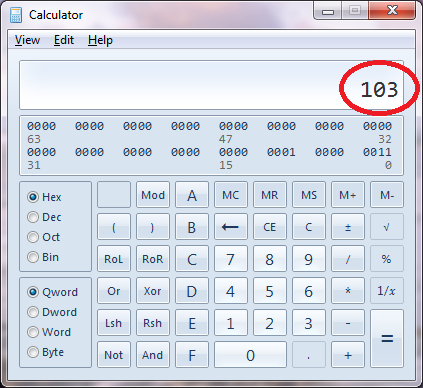 Then, count the number of HEX values you have to the left of the column. 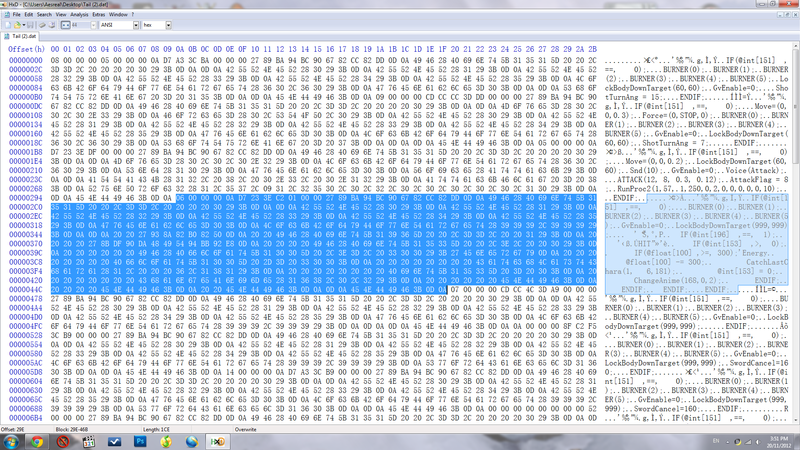 In this case, I have counted 147 HEX Values. Third, for the start of the script index, remember the 6 HEX Values? According to ritcher, they represent "A2 A1 B2 B1 C2 C1". You need to identify C2 and convert it into DEC values. In this case, C2 is 70. 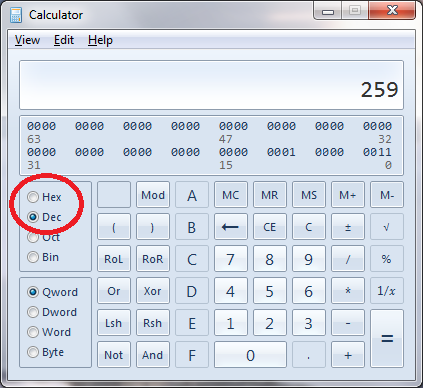 Convert it to DEC, add the amount of HEX Values that you are going to add (This amount is defined in DEC, or our standard form of counting). 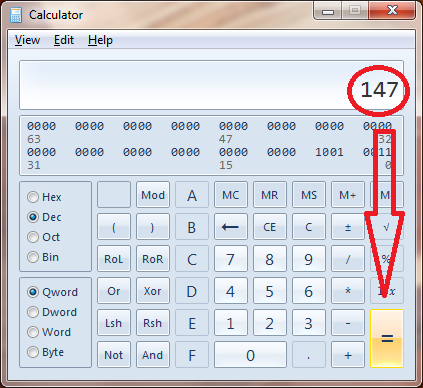 In my case it is 147, so add that number to the converted DEC form of C2, equate and convert it back to hex. What I obtained was 103 OR "01 03". This does not always happen. 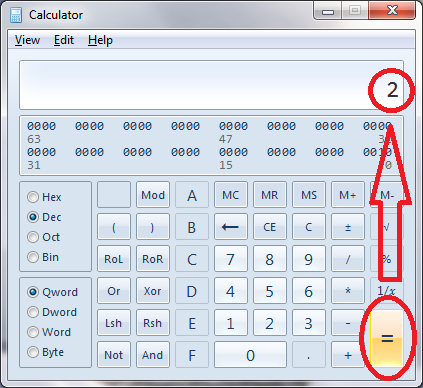 Whenever you obtain 2 HEX Values after adding up the amounts together above, this step MUST be utilised. 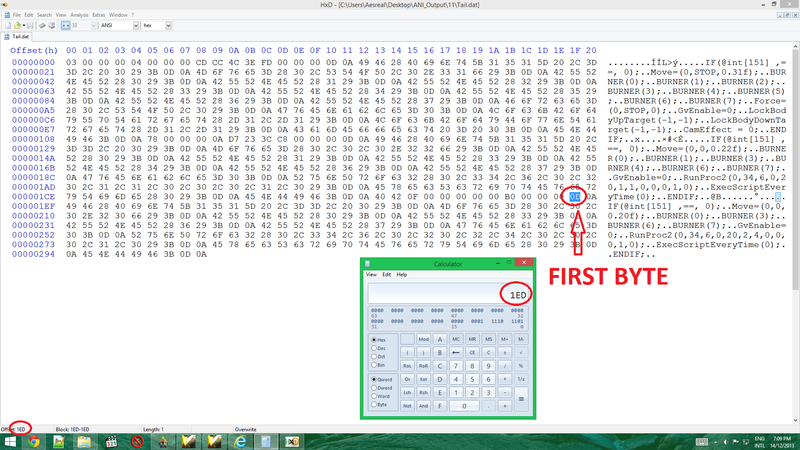 Since there are now 2 HEX Values, Add the FIRST HEX Value to the C1 HEX Value. 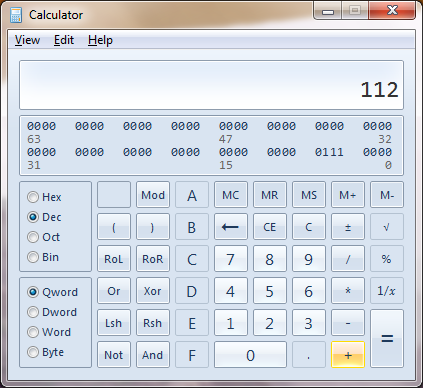 In this case, C1 is 01. Adding HEX 01 and 01 gives 02. 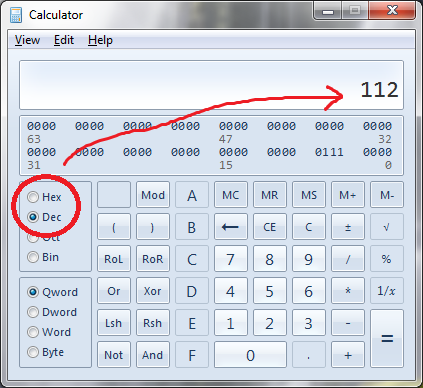 Take note that you don't have to convert to DEC for this addition, since the "01" or additional HEX Value obtained is already in HEX, NOT DEC form! This HEX value coincides with the form of the original C1 Value, which is in HEX. Adding them up, will give the new C1 value. 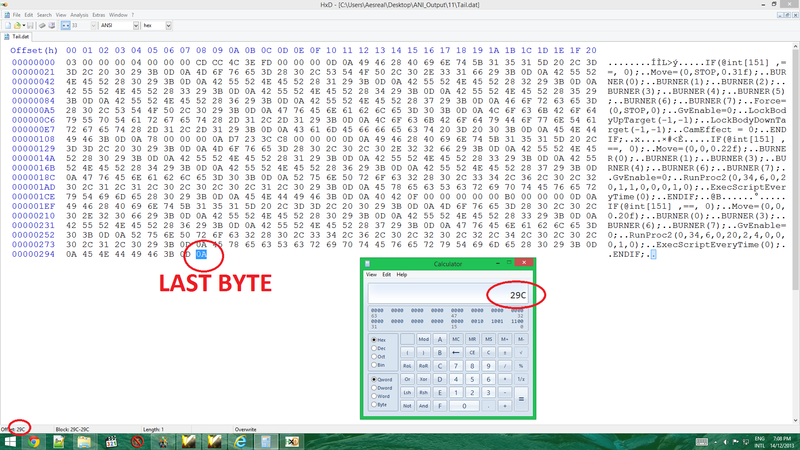 Since, the second byte given in the C2 Value is 03, the new C2 C1 Value thus becomes 03 02. Note: If C2 gives ONLY 1 HEX value, there is NO NEED to touch the value of C1 at all. 1. Key in the original C1 HEX Value 2. 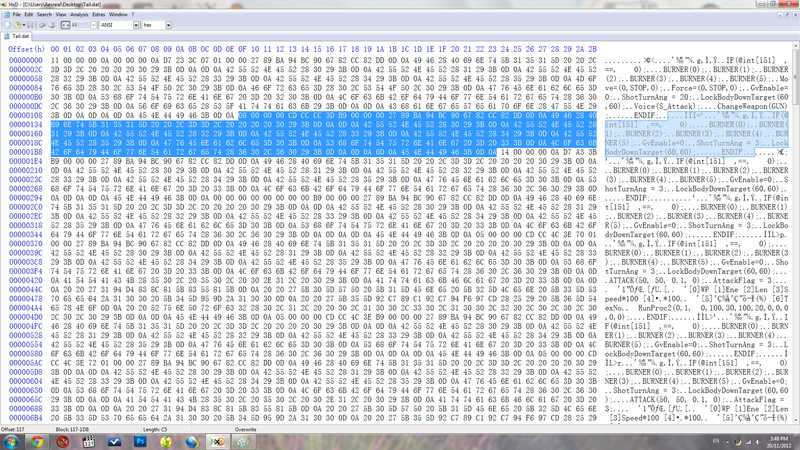 Add in the additional HEX values that you obtained from the spill-over C2 HEX Values. 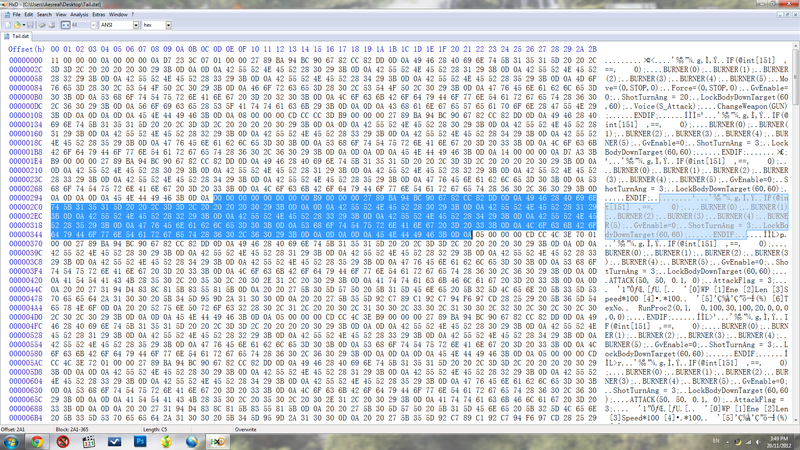 Third, replace the original C2 C1 values with the new HEX Values obtained. To obtain the values in Violet. 05 00 00 00 CD CC 4C 3E 03 02 00 00 27 89 BA 94 BC 90 67 82 CC 82 DD 0D 0A ....ÍÌL>p...'‰º”¼.g‚Ì‚Ý..
Lastly, place in the code that you typed ANYWHERE within the script index, making sure that you do not screw up the other codes in the process. Remember to change the C2 C1 Values! 0);....BURNER(0);..BURNER(1);..BURNER(2);..BURNER(3);..BURNER(4);..BURNER(5);..GvEnable=0;..ShotTurnAng = 1;..LockBodyDownTarget(60,60);....ATTACK(50, 50, 0.1, 0);..
AttackFlag = 3;.... '1”ÔƒŒ.[ƒU.[.. 'WP Ene Len Speed*100 •.*100.. '’Ç‰Á’Ç”ö—Í(%) TexNo.. RunProc2(0,1,0,100,30,100,20,0,0,0,0,0);..
BURNER(0);..BURNER(1);..BURNER(2);..BURNER(3);..BURNER(4);..BURNER(5);..GvEnable=0;..ShotTurnAng = 1;..LockBodyDownTarget(60,60);....ATTACK(50, 50, 0.1, 0);..AttackFlag = 3;.... '1”ÔƒŒ.[ƒU.[.. 'WP Ene Len Speed*100 •.*100.. '’Ç‰Á’Ç”ö—Í(%) TexNo.. RunProc2(0,1, 0,100,30,100,20,0,0,0,0,0);....ENDIF;..
0);WeaponAttack(,3,0,0);WeaponAttack(,3,0,0);WeaponAttack(,3,0,0);WeaponAttack(,3,0,0);ShotTurnAng = 1;..LockBodyDownTarget(60,60);....ATTACK(50, 50, 0.1, 0);..AttackFlag = 3;.... '1”ÔƒŒ.[ƒU.[.. 'WP Ene Len Speed*100 •.*100.. '’Ç‰Á’Ç”ö—Í(%) TexNo.. RunProc2(0,1, 0,100,30,100,20,0,0,0,0,0);....ENDIF;.. Here is a video to illustrate what would happen if the script above is done correctly. Once again, pardon me for the lack of quality. My computer is getting old. So what happens when you want to make sure that a script plays an attack multiple times before it moves on? It is actually very easy. Take a look at the script below, which is a direct copy of KD-05_3's Default Subattack 3. And this extra code before the "AttackDelay" commands. What the above code does is to check references and return the command. In this case, at the very start, int is defined as 0. Each time the script runs all the way until it hits the script index with the code just directly above this, 1 is added to the value of int. So int becomes 1. 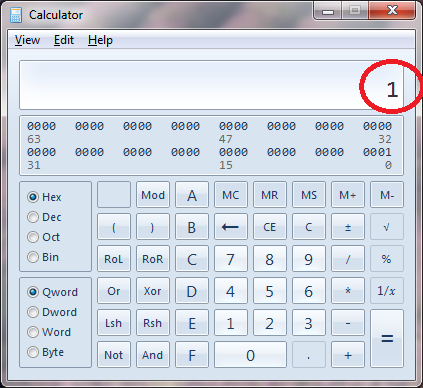 If the script is repeated, 1 is added to the new value of int once again, such that it becomes 2. This goes on and on until the script stops. would be read. Otherwise, if int is 2,3,4,..... then the script reader instantly skips this command. The reason why the @int command is placed OUTSIDE the conditional command is also because of this reason. The @int command will never be processed, if it is placed inside the conditional command, since the script reader would always skip that command altogether! Since we want 10 shots, and the original script only has 6 shots, that means, 4 additional shots are needed. So, now I'll choose the script indexes that I would place the larger code in, to give me 4 additional shots. In this case, I choose the last 4 shots to be replayed. You can also choose the middle 4 shots, or really any 4 CONSECUTIVE shots. So long as your GoScriptIndex Command directs the script reader to the correct script index with the correct number of times, it is fine. Do remember that all "tail.dats" starts reading the first script index as Script Index 0. Also, don't forget to add in the "ENDIF;" command to end off the command. Otherwise, when the number of "IF" commands and "ENDIF;" commands does not match, the game gives and error. If I were to make the script that I have just explained, it would probably be something like this. If you have done it correctly, something like this should happen. Ignore how the mech points to other directions at the end. There is a lack of a lock body function to point the gun in the right direction, also it is not the focus of the video. Notice how there are 10 shots fired off from the mech now? You can also use this method to replay a subattack multiple times. ........ÍÌL>p...'‰º”¼.g‚Ì‚Ý..IF(@int ,==, 0);....BURNER(0);..BURNER(1);..BURNER(2);..BURNER(3);..BURNER(4);..BURNER(5);..GvEnable=0;..ShotTurnAng = 1;..LockBodyDownTarget(60,60);....ATTACK(50, 50, 0.1, 0);..AttackFlag = 3;.... '1”ÔƒŒ.[ƒU.[.. 'WP Ene Len Speed*100 •.*100.. '’Ç‰Á’Ç”ö—Í(%) TexNo.. RunProc2(0,1, 0,100,30,100,20,0,0,0,0,0);....ENDIF;.. Typically, every Tail.dat starts with a Hex number at the very start. It represents the number of script indexes, followed by 3 nulls, another number, another 3 nulls before reaching the A2 A1 B2 B1 C2 C1 values. The first number (a.k.a. 01) represents the number of script indexes. 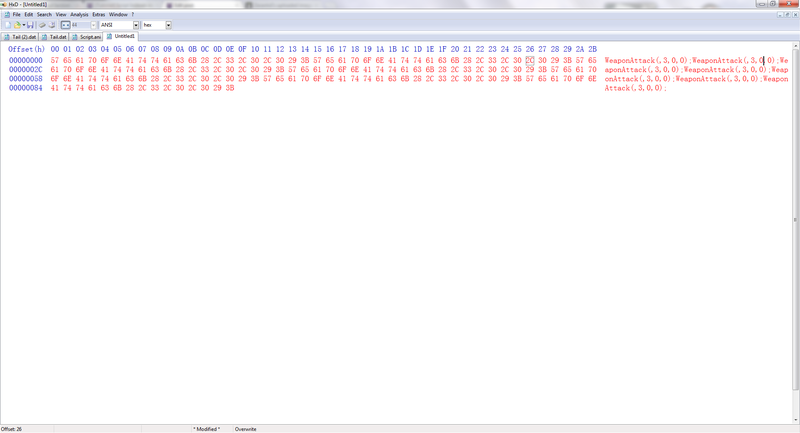 So let's say you have 10 script index, convert this from DEC to HEX format and you get 0A. Replace that 01 with 0A and add another script index. Removal of script indexes follows the same way. After which, every script index in the Tail.dat begins with the SECOND number, 3 nulls, A2~C1 values. 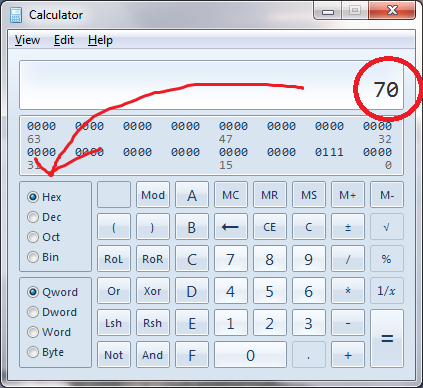 This number represents how many deciseconds the script index would be played before moving on to the next. 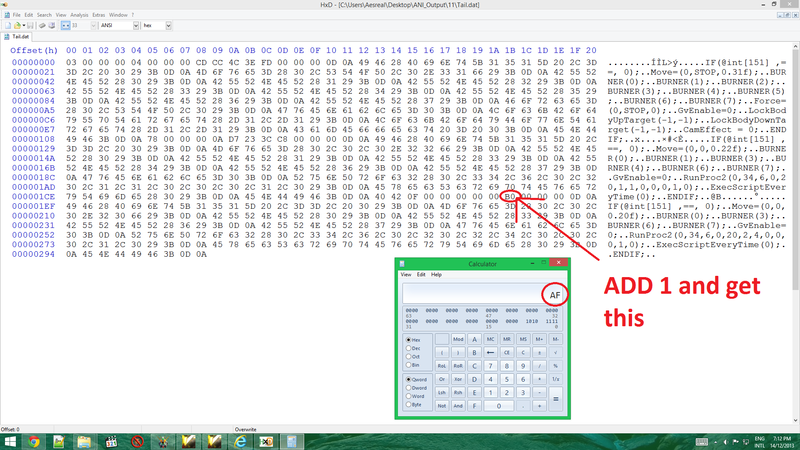 Naturally, you'll have to convert the value from DEC to HEX as well and enter it into the HEX part of the Tail.dat with a Hex Editor. There are 3 main processes to be used for effects. Processes 33, 34, and 62. The main use of process 34 is to reduce melee damage. However, due to the dual animations that it has, it can be used in creating animations (Eg, feathers, GN Particles). The 0 represents the typical index, where if multiple process 34 are played, this would determine which plays out first. The 34 is the process. 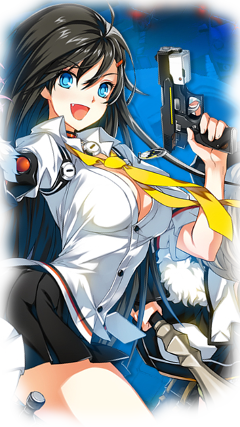 The 2nd 0 represents the weapon point, where the effect is supposed to appear. Although in the game, this process seems to be bugged since it does not appear at the right place. The 500 represents the amount of energy gauge that would be used due to this process. The 2 represents the XFile number for the 'rotating shields', where different XFile number causes different 3D .x models to be used. The 3 represents the XFile number for the 'feathers'. The 20 represents the count for the 'feathers'. It determines how many 'feathers' would appear. The 300 represents the amount of damage reduction that the process would cause. If you are using this solely for animation purposes, set this value to 0. The 15 theoretically represents the time that the 'feathers' would last. Although I haven't really tested this yet. The 25 theoretically represents the time that the 'rotating shields' would last. Similarly to the value of 15 above, this has not been properly tested yet. The last 15 represents the dispersion rate of the 'feathers'. A high value indicates that the 'feathers' would be more widely spread. The 0 at the end is unknown so far. Now that you have learnt how to change bytes the hard way, it is time for the easy way. Now, don't go flipping the table. The methods above is to make sure you understand the process. 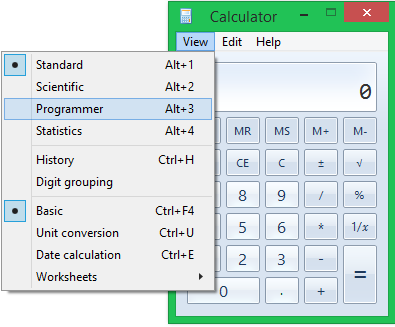 For almost all Hex Editors, they can automatically help you calculate the total amount of bytes that is needed. Look at the images below and you'll understand. 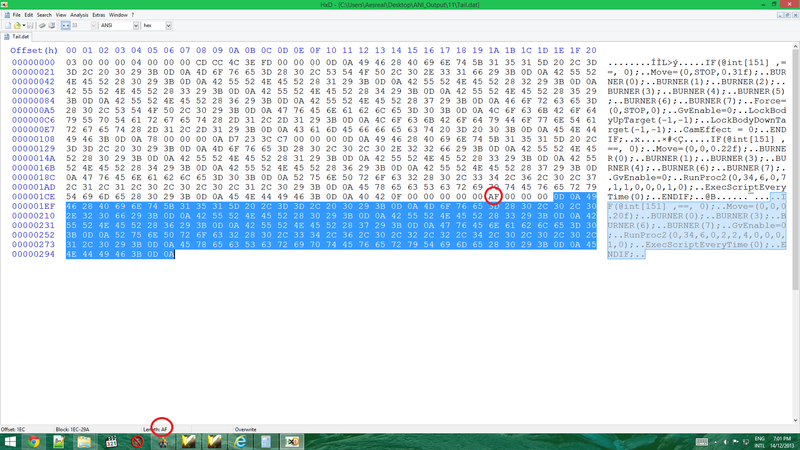 For other Hex Editors, find the OFFSET value for the LAST BYTE of the code in the ANI Block, and deduct it with the OFFSET for the FIRST BYTE of the ANI Block. Afterwards, add 1 to it and you will get your C1 C2 Value. Here's a small tip. Most values that starts with 27 (') apostrophe and ends with 0D0A (tab) are just comments. You can delete them and replace with your own string. And those comments in the middle of if string represent what the RunProc2 value is. You can just copy the line and translate via Google see what the author is talking about. Note that the comment before the actual string in not supposed to be edited without using the methods explained on the first page. Nice summary lol, I have the tendency to give grandmother stories, especially since my proficiency of the English language isn't that good. Thanks for this! You mind if I use it? EDIT: Isn't 0D 0A spacing? Tab should be 09, no? 0D0A represents carriage return which is used as sort of a tab break or spacing. Though now that I think about it. The term spacing and tab are the same. Basically it was used to make the codes look clean in a compiler. In reality. If it were to be applied in a compiler. It signifies the end of a line and a start. A carriage return tab like those in consoles. text > 0d0a -> Next text. And 09 is tab though horizontal tab though isn't a (carriage return). Maybe we should categorize it as this. I see, so carridge return is the technical term for it. Thanks! But isn't spacing 20, not 30?? part before it is probably an array telling when to run the script section, how many times to execute it, and the length of the script. Do you know exactly what it does? Like which part represents which. It would definitely help alot if you do. the table boxes just change the font size to make it fit, and if that doesn't then its another 4.0 issue.